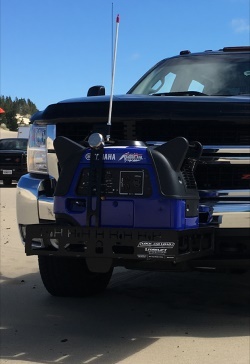 Comes In Models For 2" and for 1 1/4"
Dimensions - 56" x 23"
Usable Dimensions of 59 3/4" x 19 3/4"
Dimensions of 60" x 20" x 2 3/4"
Dimensions of 48" x 20" x 2 3/4"
Love riding but also love post-ride tailgating? Now you can have both. 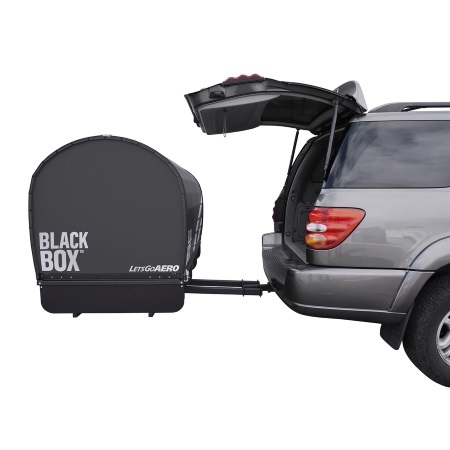 The Pivot allows your bike rack up to a loaded 4-Bike to effortlessly swing away, providing ample clearance for tailgates, reardoors or just increasing your hatchback access. 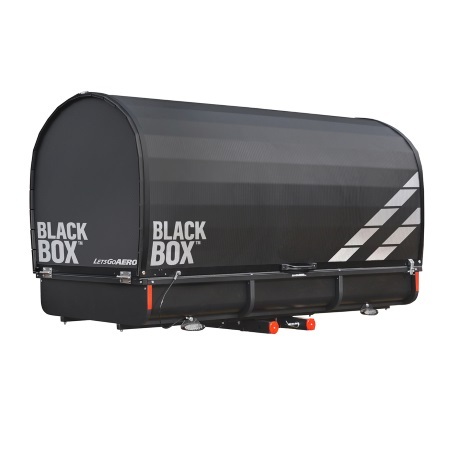 56" x 18" x 21"
Rainproof Construction, Perfect For Luggage, Camping Equipment, etc. 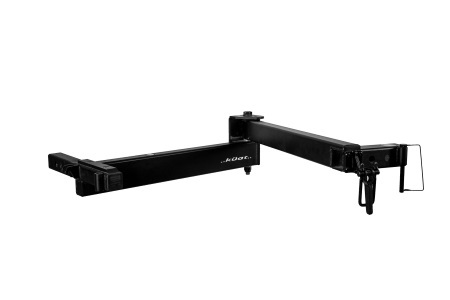 56" x 22" x 21"
59" x 24" x 24"
59" x 18.5" x 24"
Medium - 48" x 20" - Internal Dimensions 46 3/4" x 17 1/4"
Large - 60" x 20" - Internal Dimensions 57 3/4" x 17 1/4"
Length 21 1/2", Width 37 1/2", Height 15"
This 4 foot slide out hitch rack uses our TwinTube telescoping platform for rear vehicle clearance while handling large equipments. 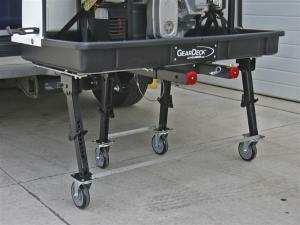 Designed with an ample 32" width, solid flooring and high rails, GearCage contains and protects cargo from road grime. 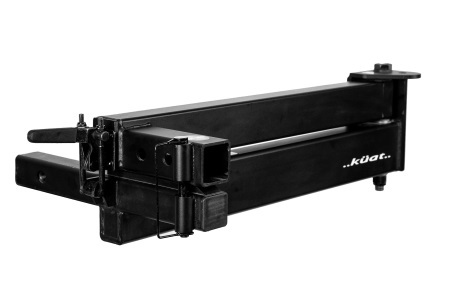 Sold/ships as a kit; assembly required. 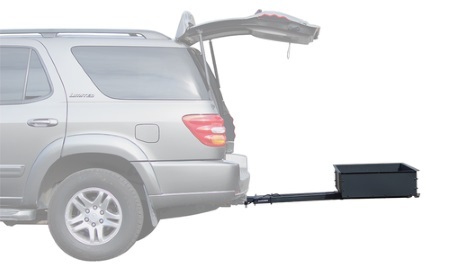 This 6 foot x 32 inch, industry largest hitch rack is built on our TwinTube slide out platform that is strong, stable, and easily telescopes for rear vehicle cargo bay access. 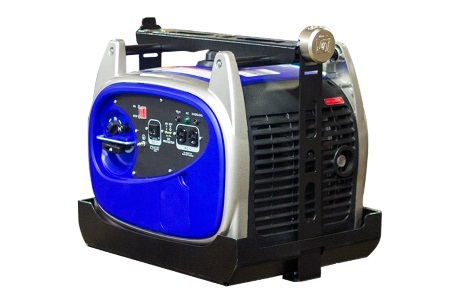 Ideal for pick up trucks, SUVs, and RV motor homes. 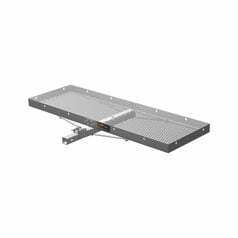 Solid flooring and high rails contains and protects cargo from road grime. 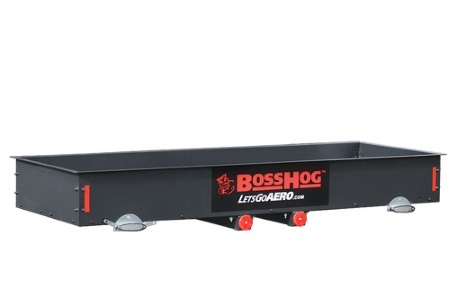 66 x 24 x 7"H extra large solid-walled hitch carrier protects gear from road grime with LED lights for rear visibility while handling very big cargo loads including bicycles. 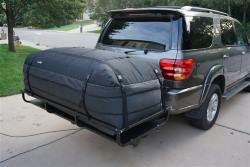 The user-friendly slide out mount offers rear hatch access for SUV, trucks, and Sprinter RV doors. 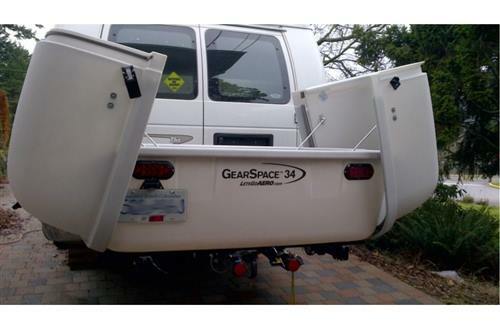 Many fresh and exciting add ons offered for gear management and coverage. Extra large, rugged, and weather-resistant cargo storage bag for all travel needs with an expandable design custom fit for our GearCage 4 rack models, or use with other basket style cargo racks. 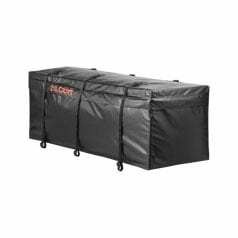 Super-size, rugged, and weather-resistant cargo storage bag for all travel needs with an expandable design custom fit for our GearCage 6 cargo rack models. 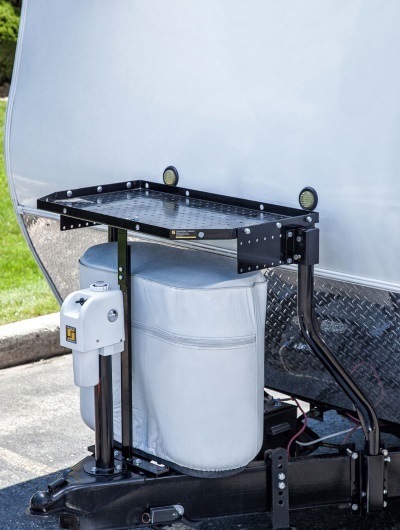 This 34 cubic foot enclosed carrier holds all kinds of cargo ranging from luggage to up to two bicycles and is built upon our GMC award-winning TwinTube slide out hitch mount platform. 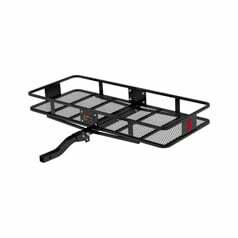 Tough and buff, this world class automotive grade carrier is made for real life capacity needs among RVers, families, and group touring travelers. 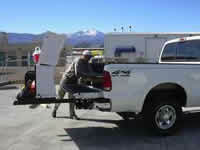 This 17 cubic foot hitch storage box is ideal for hauling both travel gear and utility equipment including generators. 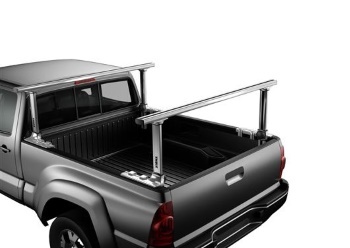 Built upon our GMC Award Winning TwinTube slide out platform, this system is strong, balanced, and slides out for rear car and RV access. 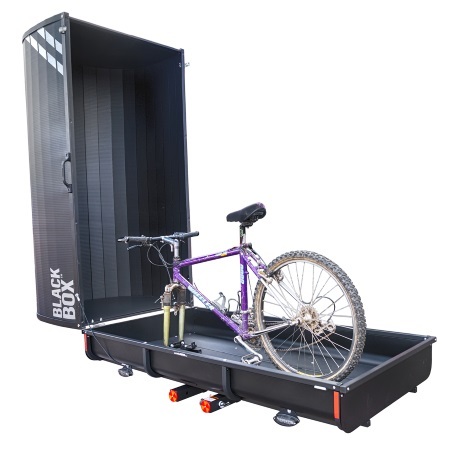 Black Box cargo carrier offers 51 cubic feet of storage space for up to four bicycles, tons of luggage for group travel, large mobility wheel chairs, scooters, and other equipment for travel and trade. 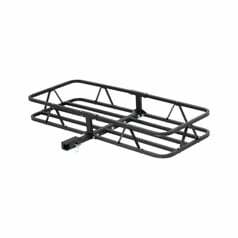 The strong and stable dual tube slide-out frame is ideal for clearing RV Sprinters, motor homes, trucks, large SUVs and passenger van doors. 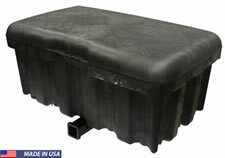 Note: There is a 1 1/2" lip that runs all the way around for the cover to rest on. 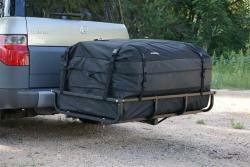 Full featured hitch cargo box with tilt down design allows for partial access to trunk, hatch or tailgate. 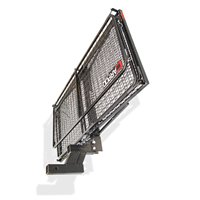 L 48 3/4" x W 24" x H 22"
Transport extra long payloads with help from the HitchRack truck bed extender! 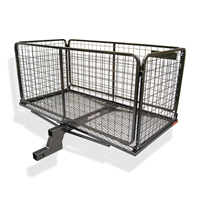 The HitchRack is constructed of heavy duty steel tubing giving it a distributed weight capacity of up to 750 lbs. 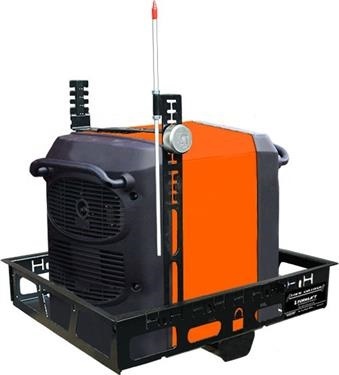 On the sides and front of the truck bed extender are reflective strips for added visibility along with an included bright orange safety flag to attach to the end of your load. 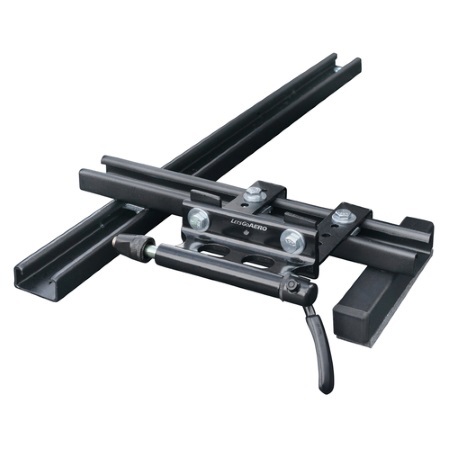 The support arm can be adjusted width wise and height wise allowing you to use the HitchRack for many different applications. 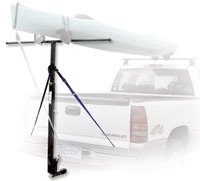 Adjustable Width - 28.25" to 48.75"
Adjustable height from 4" to 10"
Allows You To Extend The Length Of Your Truck Bed by 53"
6000 grade anodized aluminum provides added strength to carry up to 450 pounds and resists rusting for a lifetime of functionality and great looks.